We walked the short distance from Mother Goose Nursery to DKH woods with great anticipation: One child told everyone, “We’re going to a REAL forest”. The children remembered their Forest School rules of “No pick, no lick” and “Stay safe” very well. On arrival at the woods we looked at some nettles and brambles to make sure that everyone remembered about avoiding stings and scratches, and even though some of the nettles were towering above the children, and the paths quite narrow, no-one got stung. We were all wearing waterproof trousers and long sleeves for protection. Once our boundaries were marked, we played our hide and seek game of “123, where are you?” which helps us call and answer (like birds!) so that the children know how to let the adults know where they are. Snacks of breadsticks and ricecakes, and a drink of water came next, and then we lifted a rotting log to look at who lives here in the woods all the time. We saw snails, slugs, woodlice, spiders and ants all at home. The children tried not to sit on that log after they realised it was a home to so many mini-beasts. The last part of the session was spent on making a small creature by drawing a face on the end of a short, fat stick(we brought these with us). 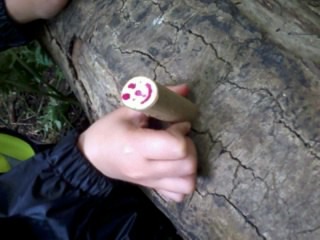 Some children peeled their stick first, and drew along the side of it too. Passing the talking stick round at the end, we all said a word or noise about the session. Some people liked the fresh air. Others liked the bird song. Different colours were mentioned, especially green, and one child exclaimed, “I love the forest! I’m so pleased that the children enjoyed their day in the woods. Looking forward to them coming back soon.